Heya folks, that time again! This week I thought it would be a good time to bring another little tidbit I've picked up from none other than GentleBen of BoLS fame. And it has to do with a fundamental change in how you go about your metallics. The idea here is to paint a Base Color of some sort before applying your metallic paints. This seems like such a simple and easy thing that anyone in their right mind would think to do, but honestly, I would have almost never thought to try this had I not been 'enlightened' a week ago! When you're painting silver, base coat the area in a grey color, such as Codex Grey or Fortress Grey. When you're painting a gold, try a Light Brown like Snakebite Leather. Looking for a rusted feel? Paint Bestial Brown under your silvers. Drybrushing seems to be the method of choice for this technique, but I can easily see it working in thin application of watered down metallics where the base coat will show through. And of course using a wash of some sort, be it inks, washes, or a custom mixture, will help bring it all to life. I've done a little bit of work with this idea recently with my Chaos Knights, doing a full drybrush of Codex Grey over all areas that were getting a Chainmail drybrush, and I have to say, I believe I'll be using this one from now on. Those of you out there looking for a quick and easy method to bring your metals to the next level, give this idea a try and see what sort of results you have from it. What the Hell is Paint? From these you will definitely get a better understanding of the theory behind using this technique, as well as some insight to other great ideas. What little tips do you have for painting metals? Thanks much for the links and the advice, GD. It's funny, but I never really thought of this technique for mini painting, yet I do something very similar like this all the time when digitally painting. 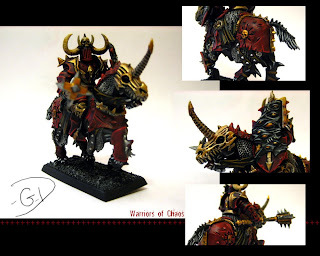 I'll have to give this a go with my ork metals very soon! As far as what tips I have, well, the only thing I do is I will sometimes paint Tin Bitz directly onto the recessed or shadow areas of lighter metal colors. It's a dark enough color that it shows up as a shadowy glaze on chainmail and boltgun metals. Watering it down a bit helps too for feathering it out into the bulk of the metal color. It works like a charm for a rusty and dirty look, but still keeps some of the metal sheen that you might lose if using non-metallic paints. I read this somewhere, but I know that at times, I have mixed (for example) an ochre with my my gold colors in order to take the level of metallic sheen down a bit, and give some more control over shadows and highlights. Most times when I do highlight metals, I will mix in some pure white to the chainmail to give a really bright shine to it. The specularity in the metallics sometimes makes seeing painted highlights difficult, but the white helps them to be more easily visible. Another little tip, is if you are painting a warmer metal color, and you use the 'add white' method I mention above, instead of adding pure white, add a colder white to you highlight metal color. This will act as a contrast to the warm metal and make the highlight feel even brighter. It's worked for me in the past! GrimTeef wrote: I read this somewhere, but I know that at times, I have mixed (for example) an ochre with my my gold colors in order to take the level of metallic sheen down a bit, and give some more control over shadows and highlights. Most times when I do highlight metals, I will mix in some pure white to the chainmail to give a really bright shine to it. The specularity in the metallics sometimes makes seeing painted highlights difficult, but the white helps them to be more easily visible. I actually just gave this same thing a try just recently. I was painting a Son of Medusa at work and realized I had left my Mithril Silver at home, so I broke out the Boltgun Metal and the Skull White and set to mixing a small bit up for my highlights. It worked out far better than I had planned on. I came across the idea for this from Aventine of BoLS and The Painting Corps. He is painting his Lamenters metallics this way. This, of course, looks really good, because it actually uses real properties of lighting. The more shaded a metallic is, the less it shines, of course. This is pretty common knowledge, but for some reason it's really easy to forget when you're painting. This is a great place to start. It can get much, much more complicated than this, but it's almost not worth the time (part of the reason why I stay away from metallics as much as I possibly can). It involves shading using a flat color as you would normally (one that matches as close as possible to any given metallic), and slightly adding in more and more of your desired metallic color as the base color gets brighter. The ratios get really, really wacked out (especially depending on how detailed you want the finished product), and it's not exactly worth mentioning it. Start here, and you should get the jist of it eventually. The short and sweet tutorial is appreciated. Not much to add here, but I've been doing this for some time now with good results. My usual color for the basecoat is Scorched Brown. When you think about it, it could be nearly anything though. A dark green might be good for weird Chaos metals maybe. I guess highlighting and shading the base colour aswell would be a good idea? Good tip, thank you. I'll have to try that. I use a similar technique for my Eldar to give their armor an alien, shimmery quality. I mix a darker metallic with my basecoat and a lighter metallic with my highlight color, then very lightly highlight with the lightest metallic color alone. Great tip! I was skeptical at first, but I've used this technique to very good effect over the last week.